Books on logic can be found in the Mathemathics Library Stacks on the main level shelved under call number 511.3 to 511.4. The discipline of Mathematical Logic is a rather historical umbrella encompassing the fields of Model Theory, Set Theory, Descriptive Set Theory, Computability Theory (also known as Recursion Theory), Proof Theory, and Universal Algebra. 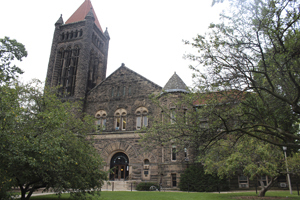 The research of the logic group at Illinois focuses on Model Theory (Lou van den Dries, Philipp Hieronymi) and Descriptive Set Theory (Anush Tserunyan). K. Tent and M. Ziegler, "A Course in Model Theory"
D. Marker, "Model Theory: An Introduction"
A. Kechris, "Classical Descriptive Set Theory"